A work colleague who I playfully call "my personal style icon" told me that she was assessing her closet contents by whether they were age-appropriate. She is beautiful, high-energy, smart, and talented, and in her mid-50's has two adult children and a grandchild. And she dresses really, really, well. She has a unique ability to look professional and credible without sacrificing a very identifiable sense of relevant style. Not long after this conversation, I read Angela's birthday post, and then I'd been considering for VOCABULARY who would wear the clothes I make. Are they too "young"? Too "mature"? Will I ever get to an age where I am making clothes I would not wear myself? Multilayered issue, this dressing your age thing. It can get complex. I think that we access something very powerful when we decide what to put on today. It is sometimes a reflection of how we feel about ourselves, and conversely (sometimes simultaneously) it can do a lot to influence how we feel about ourselves. And it almost always influences how people see us -- an obvious first clue others look for when they try to understand who we are. I remember the point in my youth when I understood that clothes had the power to establish my identity. As a child, I was 100% tomboy, kind of tough-minded, and in junior high school I didn't wear a skirt or dress once. (I never had a boyfriend then even though I had my share of crushes and I'm betting the tomboy thing had something to do with it.) We moved the summer I turned 13, and knowing I was going to a new school with people who'd never met me, I took the opportunity to change how people would see me by changing the way I dressed: I showed up to my first day of high school in a sunshine yellow knit romper. I noticed that my attitude softened a little, too. still chill with Ricky Schroeder, in all his Tiger Beat glory, looking on. Since then, I've spent a lot of years trying to wear clothes to appear older than I looked. I remember trying to be very smooth in college, working some snug-fitting clothes into the mix, to accentuate any hint of curve to compensate for looking like I was still 14. And right out of college, I took the advice of my first business mentor, who suggested I only wear suits when working with clients to increase their confidence in working with someone who looked so young and "green". I stopped thinking about these things when I got pregnant -- "Can I just get something that fits?" -- and dressed a bit sloppier than usual until my son was about 3. And now that I've been paying attention again these past few years, I wonder if I'm coming out on the opposite end when I address the question, "Am I dressing my age?" your original images, etc. etc. Can you imagine my surprise when I saw yesterday an article related to this very topic in the W magazine (Sept. 2009) on page 180? Sooooo... feel free to grab your cup of coffee/ tea and keep this conversation going with another comment to this post. The subject is not closed by any means. You know I'll ask what you think about it again in another, oh, 350 days or so. Since I turned 50 I've given a lot of thought to how to dress and I think I've had a revelation. My mother's generation were quick to point to "the mutton dressed as lamb" but the rules have changed. In fact there is only one rule - at any age, dress according to what suits your body shape. Just look at a plump teenager in skinny jeans and you'll see that bad taste is not an age thing. I also think that there is something liberating about dressing as an older woman. You you don't have to follow trends, but there is nothing stopping you from trying new looks. Wear the trendy jacket, tshirt and necklace but you don't need the mini skirt as well! I kept my comment on the last post pretty PC but I've definitely got opinions on what it means to dress your age, but really I only expect them to apply to myself. I agree with Gail that it kinda matters more that you dress to suit your body shape than if you're wearing cartoon characters or lace edged shawl collars on your sweaters. how cute you were at 9 - what a gorgeous photo .. all the books I read on clothes and wardrobe planning say the same thing, - to know your look and just mix it with more tailored or neutral items as you get older. Still, look at Vivienne Westwood - I can't believe she's toned down an ounce as she's gotten older .. and I applaud her for holding to her own style regardless. I hope I own my look as thoroughly as she does hers when I get to her age... my look having underpants though. I like how Mary Anna said "owning my look" -- I feel it is important when you are older. To have a style and stick with it. 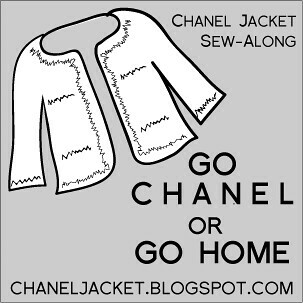 The more I read and see Chanel, the more I love it. Can't go wrong with classic. I know that I am jumping around but...as a beginner sewer last year, I would buy patterns which were "easy" to sew or the "in" look, and disregarding my age/style that would look good on me. I laugh at some patterns that I picked out on the sale days at Joanns! Now with more sewing experience, I am a lot more selective on pattern. I don't worry if it is easy or not--if I like it then I will make it work! I know alot of the things I wear are young looking but I don't feel ridiculous in them, in fact I think (and this is not delusional) that they make people believe I'm younger than I really am, despite all my gray hair. I still remember the geniune shock when people found I was turing 40 at the office. So, I'll continue wearing what I feel good in as long as it fits my body and is appropriate for the situation and venue. I forgot to say that what I see the most on the blogs and in real life is women looking older than their ages. Sorry to say, but it's usually moms who feel they have to "start" dressing a certain way just because they are moms. I don't see the logic in that unless it has to do with practicality issues. This is such a great topic and being 31 it is a very timely one for me. I am still dressinga s I wish but lately more neutral things swirm theor way into my wardrobe. Which is very good I think! Although I'm still teetering on impractical shoes. _Thanks forthis blog. I love love love it! Did I wish you a Happy Birthday? If not, Happy Belated and you can continue to celebrate with me until Labour Day. LOL. I am still trying to understand this dressing your age bit. I guess you just have to work with what feels right and is appropriate for the occasion. On that note, I am usually over-dressed. Jeans and t-shirts don't work for me. But everyone who knows me, wouldn't expect to see me in jeans. And I think they appreciate me making the effort to "dress up". The bottom line is I like it and feel comfortable put together. 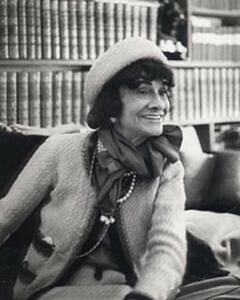 I love Chanel as much as the next person. But does it "work" for me at this stage in my life? I don't know. Years ago, when I worked in a conservative field, I sported my share of "Chanelisms". I still rock my camellias and multiple chains. Along with my gele. Now abot this jacket? What do I make it out of? I've got boucle and tweed. How about the metallic treated denim or the faux snakeskin pleather I have in my stash. Would they still be considered "classic"? love this topic! since i was a little kid people always thought i was older becuase i'm tall, but when i hit 25 or 26 suddenly people ask me what i'm studying in college and think i'm 21. i don't know if it is the way i dress, but it is a bit unnerving. i also hate when i dress too teacher-y...not holiday sweaters and long denim dresses with apples, but i definitely don't feel like i can dress like myself at work. *sigh* this topic could be covered over several conversations!! I love your old photo. And I don't think the rules related to age and dressing are set in stone. It's more of a "I know it when I see it" issue for me. This is slightly off-topic, but when I was a teenager there was a moment when I realised I would have to dress with individuality (rather than with fashion trends), because with my body shape (short and non-svelte) I wouldn't compare well, wearing the same gear as all the other teenage girls. I've been pondering this issue for a while (since you first brought it up) and I think I worry less about dressing "my age" than I do about dressing "professionally" or "relaxed" or "professionally relaxed," depending on what the situation calls for. Apart from that, it's all about what makes me feel comfortable in my body. I suppose I'm still young enough to get away with certain things (I can't imagine myself still wearing pigtail-braids at age 50, for instance), but it's also true that some of the things I would've worn in my college days no longer hold any appeal... perhaps I am acquiring a finer sense of style as I mature? I hope so. Anyway, I am enjoying reading everyone's thoughts on this topic. Thanks again. I always felt I could wear whatever I wanted- before I had a child. Now that my son is two and half and still a few years from hitting thirty, I would never think of leaving the house in a tight (even if long) teeny looking tee shirt with jeans or pants. (I hardly ever used to wear jeans.) I never noticed outright the attention a form-fitting, casual outfit brings a woman until I started walking (all the time) with the stroller. I have never dressed risque, but somehow a level of modesty is always present in the morning by the closet. That being said, I am new to sewing and have always loved living in dresses and skirts, nice slacks and classy tops. Being a stay at home mother with a husband finishing graduate school leads zero dollars for the wardrobe, but some cash for learning a new skill (and fulfilling a dream). Now, I find I must consciously construct a look by selecting patterns that I will spend hours constructing. No more casual shopping with an occasional purchase of a quality item to be matched into an outfit later. No, selecting the outfit at the onset is much more difficult. The desire to appear older, because I constantly get people thinking that I am the babysitter, is a huge factor in the selection. So, I hope to get that designers' eye- Casually shop for patterns and fabric, buy what fits my fancy, spend hours tailoring it to my body, and have a wonderful wardrobe that will last a lifetime. @Gail - What a great point -- it does seem that if you dress to suit your body shape, you're pretty much on the right path. @Sarah@Neoteric.Traditional - I wish I could say I don't expect others to live by my ideas of dressing age-appropriately... but I think sometimes I do! @Mary Nanna - Vivienne Westwood is a real force, isn't she? I'm very interested in her interest in environmental deterioration, her active resistance to propaganda manifesto, her creativity, etc. There is much to be interested in! 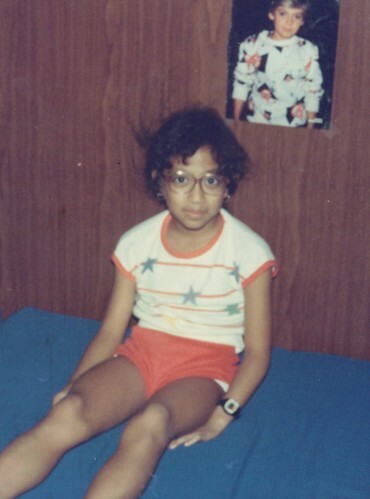 BTW, I made my son come into the room while I was staring at that photo of me at age 9-ish, to see if I could see any of me (then) in him (now). Ha! @Cindy - It is easy to forget what looks good on us when we have the promise of a dress in two hours. Totally. @lsaspacey - Love your example of dressing more youthfully convincing your co-workers that you're much younger than you are! How cool is that? Maybe you have seen some moms confess on their blogs that they are dressing differently... I know I tossed all the miniskirts after my son was born, and my mantra was, "These are not appropriate clothes for someone's mother." But there was a period of time I didn't feel very comfortable with my body. It didn't feel like mine again, for sure until after nursing, and then for another year or two while fat was redistributing around my body on its own. Not sure how to explain it, but my clothes never fit the same from month to month. It was just a tough time for self-confidence overall and I am sure it came through in the way I dressed. @Meg - There are some impractical shoes that are so beautiful or make you feel so great when you see them on your feet that you can't deny them. I wear them and hobble through the day. LOL Ask me again when I'm 40 and I might be over that! @carriegirl - I would think that it's tough to wear above-the-knee dresses in school, when you're probably picking up pencils from the floor all day and maybe chasing kids around. My son's school has pretty hip teachers like you, I guess, and when you said "teacher-y" I was not thinking about Halloween vests or anything like that!!!! Promise. @WendyB - Thank you! I was not sure I wanted to share that photo but it really says a lot about the 80's for me. Yes, the rules aren't set in stone and it seems that generally things get easier as I get older. Like, I remember being a teenager and thinking 30 was way over the hill. Then Cameron Diaz and a whole generation of famous beautiful people were turning 30 and 30 was the new 20. Now that 40 isn't so far away, I feel lucky that Nicole Kidman and Halle Berry are making 40 the new 30. (But the botox is another story.) And now maybe I am way off topic. @Violet - Nothing's off-topic here! You learned to dress to suit your body from an early age. Lucky you! @Jenny - Sounds like you will be sewing with a purpose from the get-go! So great that you already know you want to sew clothes you'll wear for a long time -- I've done my share of buying fabric because the price was right, and not because I loved it. This will be a very productive endeavor for you, I'm sure. Good luck and keep us posted! Hi, I've been reading your blog for awhile now and I decided to comment for the first time today because I have been struggling (for lack of a better word) with this issue for awhile myself. The comments about dressing in a way that is flattering to your body are spot on. I'll be 38 next month and after my post-baby, sloppy fashion phase, I decided to update my wardrobe and I bought myself a bunch of "grown-up" clothes. But I never felt myself when I wore them. And I never felt comfortable or confident. So I decided to update again. This time I chose clothing that I feel confident in and that is how I judge age-appropriateness. And while my hem-lengths have gotten longer and the rise on my pants has gotten higher, I'm less a slave to someone else's definition of appropriate fashion for women over 35. And I feel so much better. I too have been pondering this off and on. I realized that I started dressing better once I got my new job. Everyone in my new workplace dressed nicely every day, whereas in my old workplace, most dressed casually. I managed people and led meetings while wearing jeans and a t-shirt! One person on my staff came to work in his sneakers, and changed into his flip flops once he was at his desk! So at my new job, the dress code is a bit higher. Though there is a woman who wears the holiday sweaters and she's 54. I realized I like looking nice and I also like wearing clothes that fit well from all angles (front, side *and* back). The styles that stay in our closets for the long haul are really ageless -- we simply change what we wear with them. @Kyle - Isn't it interesting to see how dress code and office/ company culture are related? I went through a period where I thought dressing more casually at work was a good thing. I never wore jeans to work, but my daily mode of dressing was most definitely business casual. It is so much more comfortable to dress more business with less casual.